Scrub potato, wrap in foil and bake in oven at 400 degrees until easily pierced with a fork (1/2 to 2 hours). Dice vegetables and place in saucepan. Mix together Ranch salad dressing, salsa, lemon juice, dill weed, marjoram and pepper. Pour over vegetables. Heat over medium-high until bubbly stirring often. Cover and turn to low. 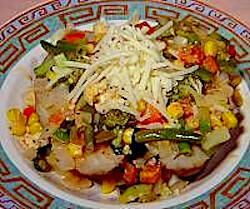 Continue cooking until vegetables are tender (about 3 minutes). Split potato and top with vegetables. Sprinkle mozzarella cheese over the top and serve. use of the Living Cookbook. I love the Living Cookbook!